Prof. Anthony Bonanno, Cettina Caruana Curran, Maria Grazia Cassar, executive president of Din l-Art Ħelwa, President Marie Louise Coleiro Preca, Simone Mizzi, Stanley Farrugia Randon, and Prof. Lucio Mule Stagno. 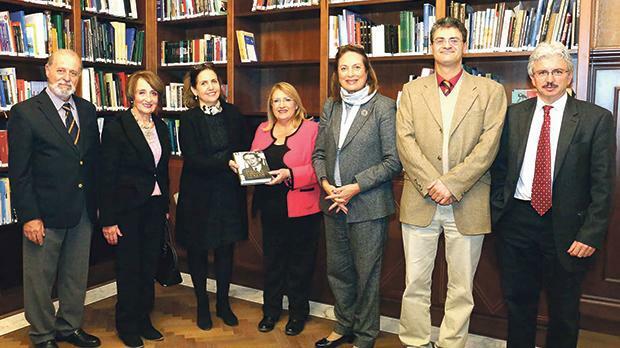 Din l-Art Ħelwa officials recently presented a copy of the book Maurice Caruana Curran – Guardian of Heritage and Justice to President Marie Louise Coleiro Preca, who is also the patron of the heritage organisation founded by Judge Caruana Curran in 1965. The book was published to mark the 100th anniversary of the birth in 1918 of its founder president and recounts his accomplishments in the many fields in which he excelled during his long, productive and versatile career. It is lavishly illustrated with many photographs capturing key moments in the judge’s life, and contains some 37 written contributions from many of Malta’s leading thinkers, legal and literary experts, and many close to him in the field of heritage conservation, capturing the vision of the late judge who, with his many landmark judgments and his timely foundation of Din l-Art Ħelwa, served his country and wished to leave it a better place. The book is now available in major bookshops.